NECKLACE - SARAH COVENTRY. "CALVARY CROSS" FROM 1976. 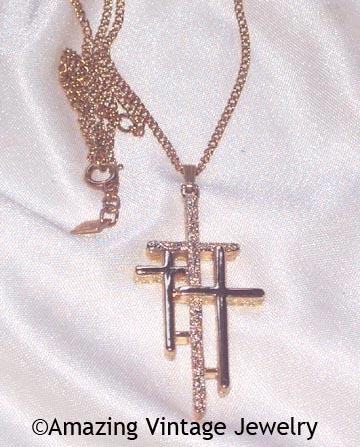 THREE GOLDTONE CROSSES - THE LARGEST IS TEXTURED, THE OTHER TWO ARE BRIGHT AND SHINY. PENDANT IS 2 1/8" LONG, 1" ACROSS. CHAIN IS ADJUSTABLE TO 15" AND 17" LONG. EXCELLENT CONDITION - IN THE ORIGINAL BOX ON THE ORIGINAL CARD. NEVER WORN - HARD TO FIND!